Tables are covered with origami cranes, vendors line the Union selling Japanese food and drinks, students bend over a Go board while a group of women play traditional Japanese music on the shamisen. April 13th 2013 was the 18th annual Central Kansas Japanese festival organized by the Japanese Student Association in conjunction with the Japanese Language Program. Students from K-State, community members, and Japanese culture enthusiasts were treated to an afternoon full of performances, music, and traditional games. This year’s highlights included Yosakoi and Parapara dance performances, exhibitions of Japanese sword fighting (Kendo) and Japanese martial arts (Aikido) and a closing drum performance. K-State students in the Japanese Language Program also sold flowers as part of the “Flowers will Bloom” fundraiser to benefit the victims of the tsunami. “Flowers will Bloom” is the name of a song written and produced by Iwani Shunji and Kanno Yoko in memory of the victims of the tsunami on March 11, 2011. Proceeds from the sale of the song are donated to tsunami relief programs. To show their support for the cause, groups from all over the world have recorded themselves singing the song and submitted these videos to the Japan Broadcasting Corporation (NHK), who has included these videos on their website and are broadcasting them on television. K-State students in the Japanese Language Program made their own recording of “Flowers will Bloom” in order to show their support, and NHK selected it for a national broadcast. Allison Adams, a Mathematics major in her second year of Japanese, remembered learning about the tsunami in her high school Japanese class. She saw the project as an opportunity to combine her passion for singing, her love of Japanese, and her drive to do volunteer work. “I’ve done a lot of volunteer work throughout high school, and now that I’m in college I find that I have less time and opportunity to volunteer for things that matter to me. (…) The project sounded like a fun way to do something that I enjoyed in a way that would potentially help other people, especially from a country that I have had interest in and studied its language and culture for what will soon be four years.” Allison was one of the students who sold flowers at the festival, a fundraiser which raised $500 for tsunami relief. 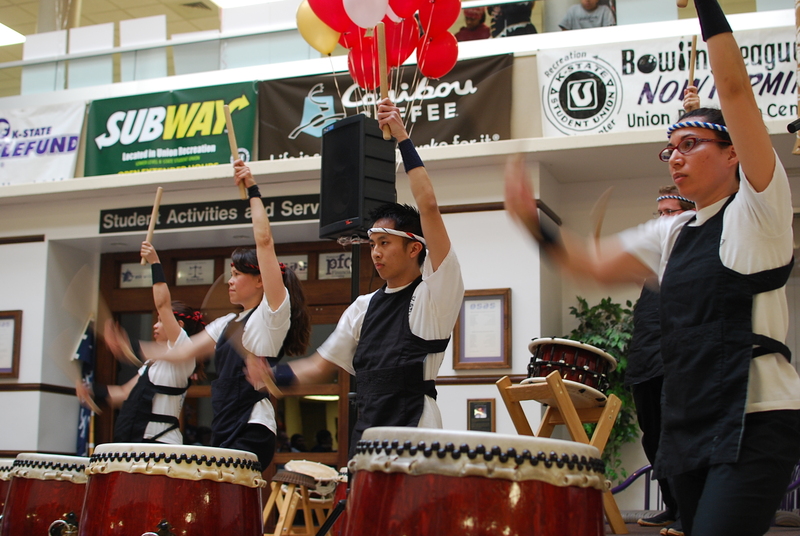 The 18th annual Northeast Kansas Japanese was made financially possible through fund-raising by The Japanese Student Association of Kansas State University. Please show your support by liking us on facebook.